Jim and I had a fun outdoor dinner experience last night in Cloverdale under some beautiful old oak trees. If you’re interested in adventures in eating, you might wanna check out a new site called Eateasy Montgomery. They put together interesting monthly dinners featuring local or visiting chefs. Our food was great and our table was “decorated” with three goldfish bowls housing one little fish swimming around for our dining enjoyment. I had assumed these little creatures were “borrowed” from someplace for the evening, but toward the end of the meal the guests were invited to take a fish home. (or two, or three, or twelve). I couldn’t get a clear answer about the fate of the unchosen fishes so I poured all three of our table’s fish population into one bowl and headed for the car. Jim had to drive slowly to avoid sloshing them onto the floorboard. After an unfruitful search for fish food at a couple of grocery stores, we were finally successful! (Choose Rite Aid for all your piscitarious needs) After we got home I solicited a neighborhood plea for some distilled water (Thanks, Dennis!) and we settled them down for the night in a flower vase. I did post a request on our neighborhood website for anyone to come get them if they were inclined to offer a home to three little golden swimmers, but alas, no takers. After a fun trip to the Pet Supermarket and a long talk with the “fish person” I was confident that I could keep these guys healthy and add them to my already too-big menagerie. After fixing up a snazzy habitat for them, I think Moe, Larry & Curley will fit in just fine. 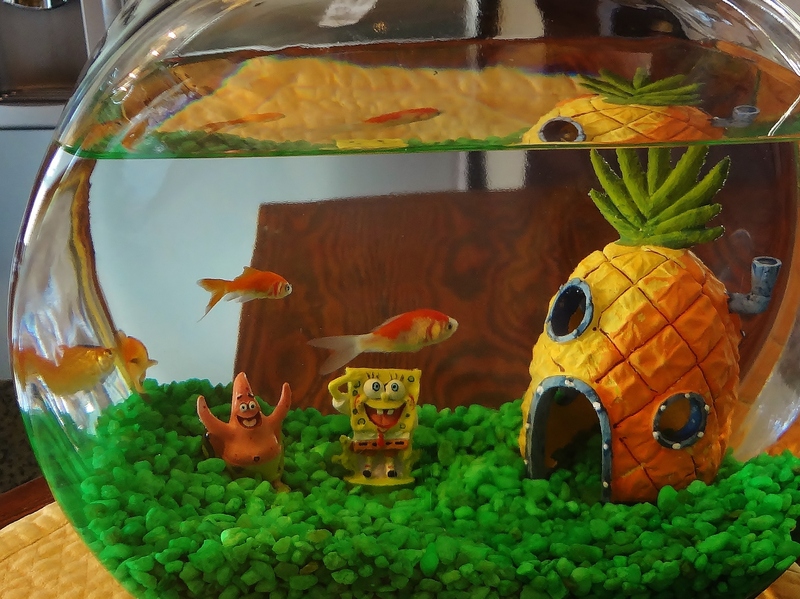 Spongebob & Patrick couldn’t be happier! They can live for fifteen years you know. Apparently not in YOUR house!